You are here: Home / All blog posts / First (dye) samples! The dye skeins arrived today and I was so excited that I played hooky from my guild meeting and dove straight in!Â I made up my stock solutions, did my calculations, and was off and dyeing. I put considerable thought yesterday into what to dye first, and what sequence to dye in.Â What I’ve decided to do is to dye samples for blends of any TWO primaries, but not to try dyeing three-primary triangles just now.Â That will vastly reduce the number of skeins required. My reasoning behind this is pretty simple: I like working with bright colors, primaries and secondaries mostly.Â Someday I’ll get around to playing with more somber colors, but for now I like the bright shades I’ve been using.Â The color wheel I want to dye consists entirely of high-chroma colors.Â So why not dye only the bright-color sections of the color spectrum? As you can see in the diagram, there are still a LOT of skeins involved, but it’s a lot more manageable n0w.Â I think I will also skip color combinations that I know will come out subdued in hue (like scarlet and turquoise, which produce brown), and focus on just the brighter colors for now. 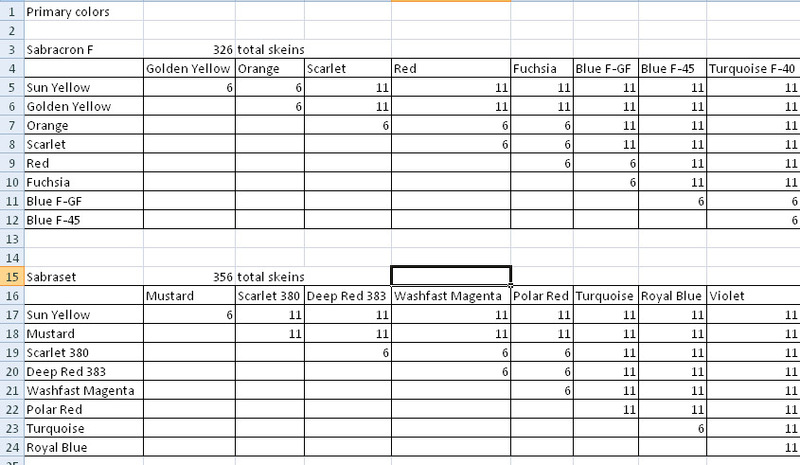 So anyway, I made my little chart, then made up a spreadsheet calculating dye formulas for each set of colors.Â I decided to dye at 4% weight of goods (4 grams dye for every 100g of yarn), and set up my collection of sampling jars in the electric frying-pan I use for dyeing samples.Â I started with Sabraset (acid) dyes – violet, turquoise, and magenta.Â I did up the entire violet-turquoise range and half the violet-magenta range.Â The skeins are cooling in their dyebath now, and I’ll take them out and rinse them tomorrow morning. One thing I noticed was that the dyes did not exhaust.Â That might be the result of using Albegal SET (a leveling agent), but I might also have used too much dye.Â For my next set of samples, I think I’m going to back the dye amounts off to 2% weight-of-goods and see if thatÂ produces better results. Photos tomorrow, once I have the skeins out of the jars!Â I can hardly wait.